If you have a website, then you should have stats for it - your web designer will probably have provided them for you. There are lots of different programs out there that will give you web statistics, and many are free. One of the most popular is Google Analytics, because it means going right to the source and (in theory) getting the best data. 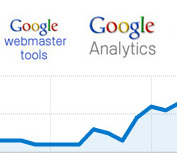 Also, because of Google's humungous budget, Analytics has a lot of fancy graphics and functionality. The kind of data you get can be anything from how many visitors your site gets to what time of day they came, how long they stayed, which pages they visited and in what order, what country they're in, how they came across your site and much, much more. It's important to check out your stats and keep and eye on them, because the information can be used to fine tune your site and gauge performance. However, it's easy to become obsessed with these numbers. This is bad idea for several reasons. First of all, traffic doesn't directly translate into sales. Revenue and profit are much more important - if you have millions of visitors, but no sales, then you have nothing. Secondly, while you're analysing your stats, you are not spending time on more important things, such as running or promoting your business. Finally, if you're looking too closely at your stats in an attempt to increase traffic, then the chances are you'll start being tempted to 'game' the system by tweaking, rather than focussing on just creating quality and value for your customers. As Google is constantly updating their algorithm and trying to make it even better at returning good results, SEO work based on complicated link text targetting, keyword density and the like is going to be fragile and could come tumbling down at any moment. Whereas, good quality content is robust and should stand the test of time. Sentiva offer web design services in Leeds.